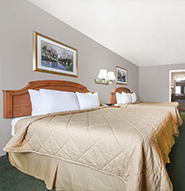 Take a break from the North Texas fun and sleep well in our peaceful accommodations in Granbury. Our spacious rooms are perfect for getaways or extended stays, providing thoughtful amenities and exceptional comfort. Rest soundly in our King or Queen rooms, guaranteed to leave you refreshed. Wake up to our complimentary breakfast so you can refuel before exploring historic downtown. For added convenience, all rooms come fitted with a mini fridge and microwave to store beverages and snacks while staying with us. Stay connected with free Wi-Fi or watch a movie on the flat-screen TV. 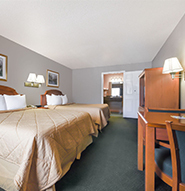 Days Inn Granbury has everything you need for a great stay in North Texas. And your four-legged friends are welcome to join you. 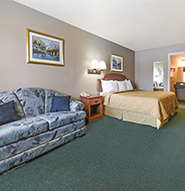 Recharge in this spacious guestroom with one king bed to stretch out in. Relish in comfort and enjoy thoughtful amenities including cable TV, free Wi-Fi, complimentary breakfast, and a microwave and mini fridge. Wind down in this comfortable double fitted with 2 queen beds. Enjioy thoughtful amenities including cable TV, free Wi-Fi, a complimentary breakfast, a microwave and mini fridge to store snacks and drinks. 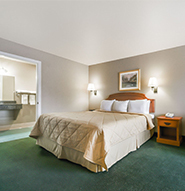 Unwind in this comfortable room with one king bed and a roll in shower with safety bars. Enjoy thoughtful amenities including, cable TV, free Wi-Fi and breakfast, a microwave and mini fridge. Accessible parking is right outside your door. Settle in to this guestroom, fitted with two queen beds and a roll in shower with safety bars. Unwind with cable TV, free Wi-Fi, a microwave and mini fridge, and wake up to our complimentary breakfast buffet.